"a squirrel eat a pomegranate". It's OK Tim, we understand that's a secret code. I'd like to watch a squirrel eat a pomegranate. Does he peel it and eat the seeds? I am not sure anything can really beat "professor of ventriloquism" as a job title. Well spotted, Murph. Now, can someone remind what it means? Things are still OK, Valerie. Momentary Blogger outage, but that's about the sum of it all. 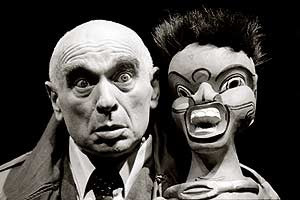 Ken Campbell was ace. That Royal Dickens Company stunt was fantastic. 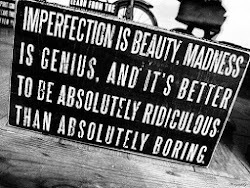 And all of the best people are probably a bit difficult to live with. Nothing to do with Ken Campbell, but I was watching Kiss Kiss, Bang Bang last night and was very gratified to recognise your tagline. Indeed, Bête. At least, that's my excuse when Small Boo berates me for my lackadaisical washing-up technique. Very observant, P, and excellent taste in deliciously silly movies. Are you giving the little one a pre-natal course in self-referential cinema? It's a brilliant film, but the self-referentiality goes over my head - I mainly like it for the way it looks.